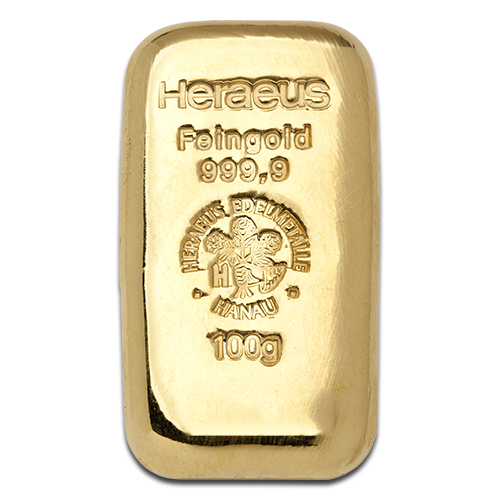 This exceptional gold bar from esteemed German refiner Heraeus is hand cast and contains 100 grams of the finest .9999 pure 24 carat gold. These gold bullion bars are a fine example of the craftsmanship that differentiates cast bars from bars that are cut by machine. It's a matter of personal preference, but many collectors enjoy the unique appearance of 100 g cast bars and they are a secure investment that will quickly increase in value. 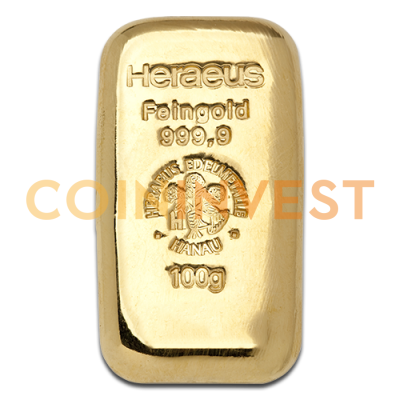 CoinInvest.com is ideally placed to find the best investment options for its customers, such as this fine 100g cast gold bar from Heraeus. Because we deal in large quantities and with some of the world's leading producers, we are able to sell at the most attractive prices. We offer a wide range of gold bars in sizes that appeal to new investors and established collectors and all orders are shipped swiftly and securely.